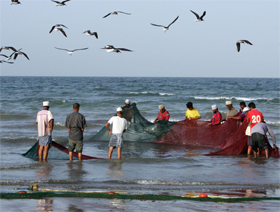 MUSCAT: Oman government is planning to develop or expand five fishing harbours in a move to help fishermen in different areas. These fishing harbours are coming up at Barka, Al Musanna, Dibba and Al Ashkharah with a total cost of RO14 million. Further, there is a move to develop a relatively big fishing port at Al Duqm with a capital expenditure of RO35 million, said Darwish bin Ismail bin Ali Al Balushi, minister responsible for financial affairs here on Monday. The plan to develop several fishing habours is part of a larger plan to achieve balanced development, which will result in a better livelihood and improved employment opportunities for people living in interior regions. Special focus has also been attached to develop industrial estates in the budget, which is also part of a move to achieve balanced development.Darwish said that RO100 million has been allocated for developing infrastructure for newly planned industrial estate in Samayil, Ibri and Al Duqm. Hilal bin Hamed Al Hasni, chief executive of the Public Establishment for Industrial Estates (PEIE), earlier said that a tender for developing Samayil industrial estate will be floated soon, as part of a move to speed up regional development and thereby create job opportunities for Omani youths. The total cost of developing the Samayil industrial estate, which is coming up almost 35km away from Rusayl, is estimated between RO25 million and RO30 million. The industrial estate will house 300 industrial units in a vast area of 7.8 million square metres. More than 80 units have already signed agreements for starting business units within the industrial estate, which is expected to start operation by the middle of 2013. A tender for developing an industrial estate in Ibri will be floated sometime before the middle of next year. There is an ample scope for setting up small and medium units using locally available material there. This region requires industries to create job opportunities for locals. Moreover, since Ibri is close to the Saudi border, industrial units can export their finished products to the large Saudi market, he said. With the growing demand for industrial plots, PEIE is trying to develop new industrial estates, besides expanding existing ones. More and more entrepreneurs are building industries, resulting in better demand for industrial plots. Expansion programmes are also under different stages of planning and implementation at Rusayl, Sohar and Buraimi for meeting demand for industrial plots from entrepreneurs. Rusayl Industrial Estate is embarking on a massive expansion for developing a vast area of 3.5 million square metres to meet the growing demand for Industrial plots from entrepreneurs. The expansion, which will be implemented in a phased manner with an estimated capital expenditure of RO20 million, will take the total size of the industrial estate to 7 million square metres. As many as 200 industrial units can come up there.